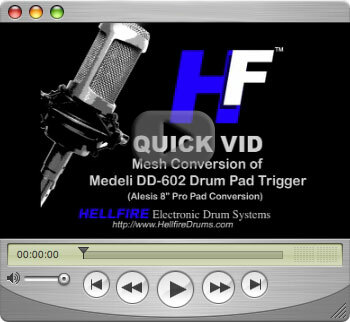 Hellfire Electronic Drum Systems - Alesis DM10 Pad Upgrade Video! Home DIY Electronic Drums Alesis DM10 Pad Upgrade Video! A lot of people in the edrumming world tend to consider a mesh pad better than most other types of triggers. For this reason I came up with a method to change out the Alesis DM10 Pro Kit‘s Pad to a mesh type conversion (Medeli DD-602 trigger Pad). This conversion is not based on a Roland cone method but a more tried and true reflection plate method. The best part is, they only things you will need to buy for this conversion is a mesh drum head (I recomend the Billy Blast mesh without the center patch) and a three sheets of 12″ x 18″ (3mm thick) EVA craft foam (comes in many color, I used black). The kind I used is called Funky Foam which I got at Hobby Lobby (most craft/hobby store should have). The sheets were $1.00 each. The Billy Blast mesh heads (three 8″ & two 10″) were $10.00 each. Before we get to the video, let me point out that the 10″ trigger pad (if you are upgrading the DM10 Pro Kit) is a touch different than the 8″ trigger pad. You will find a hole in the thick black foam of your pad. The hole is not, I repeat is not something to worry about. You will find that the trigger works just fine with the hole in the very center. So, don’t fill that hole. A couple things to note. First, by doing this modification you will be voiding your warranty on the pads. The other thing to keep in mind is that any mesh head will work. I only used the Billy Blast head to keep costs down. 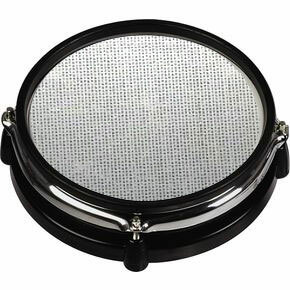 If you want a better quality mesh drum head, you can always use a mesh head manufactured by Roland or Hart. If you are not in the states you will have a much larger variety of mesh head companies to choose from. Some have done the conversion without desoldering. If you get a chance you might want to check out DMdrummer.com as I know a few member over there have done the conversion that way. I hope that helps. Go with the 3-ply, you will not regret it. Awesome work, converted my bass pad and now I can finally play during the night! It rocks! Kind regards and lovin’ the site, bro! I’ve never tried them myself (as I live in the USA) but, from what I’ve heard, they are pretty good. Thanks for the info on this conversion, you have helped a lot of people! Just a comment about using the stock heads instead of mesh ones. In my experience the converted pad is actually quieter than the unconverted pad. The stock pad has a lower end thud which presumably comes from almost directly hitting the metal plate. After conversion that low end disappears because the plate is not being struck directly. Perhaps the stick to head contact is slightly louder than the stock pad but overall it’s a much higher pitched sound that will probably not transmit as easily through walls. Also the feel is very good with the stock heads, perhaps more realistic than the mesh rebound once the conversion has been done. So if noise is not an issue it may be worth trying the stock heads first. Here’s a trick I use to get a more realistic experience without using Superior Drummer. Wearing headphones I turn down the volume on each drum on the module and start tapping a pad. I can hear the acoustic sound of the pad at this point (because I’m using the stock heads). I then gradually raise the level of that drum sound to a point where it blends perfectly with the acoustic attack. I repeat this with the other drums and cymbals and my kit is set. I find this gives an edge of realism you don’t get with mesh pads but it’s worth trying it with different types of headphones including in-ear to see which gives the best balance between acoustic and sampled sound. I recently did this conversion on my DM-10 Studio Kit. I love the feel but my question is concerning the kick drum. I have been having trouble with it not soundimg all the strikes. It will hit a couple times then it’s like I’ll strike the pedal but it doesn’t make any noise.Could this be from overtightening the head or should keep trying different sensitivity settings, if so are there any settings that you recommend? I would try adjusting your settings first. Mainly the retrigger setting. If that doesn’t work, you may have damaged the piezo or piezo wiring while doing the conversion. I hope that helps. It has to do with your module setting. If you get a chance you should check out DMdrummer.com. I hope that helps. Hi, I LOVE this upgrade to mesh heads but I encountered some problems when I did this to my 12″ Alesis DM8 Pro kit snare. When I did this upgrade on my single zone 8″ kick drum, it worked flawlessly, but when I did this on my dual zone snare, the snare triggers the rimshot sound when hit harder now. I have to barely hit the snare to get a snare sound & when I hit the snare harder, which is the way I play, it triggers the rimshot sound instead of the snare sound but the rim triggers works perfect & will not trigger the snare when I hit the rim like the snare triggers the rim trigger? I do, however, want to say that I play on a DM8 Pro kit but have the DM6 USB kit @ home to practice on so as I do the upgrade on my DM8 Pro realhead drums, I try them out thru the DM6 USB drum module first until I get to where we practice so I can put the DM8 drums back thru the DM8 Pro kit module so my problem may be because the DM6 USB module doesn’t have “crosstalk” adjustment & the DM8 does. My 8″ kick drum that worked perfect thru the DM6 USB module is only a single zone trigger & my snare has dual zone triggers. THANKS IN ADVANCE for any help on this as I have to play tomorrow night w/ this snare. Also, if you get a chance you might want to have a look around at http://www.DMdrummer.com. There is a lot of good info there for Alesis drum modules. I hope that helps. So this conversion works with the new dm10x as well? Do you still need the resistor taken out? Also, would you do the kick drum the same way? Thanks. Great ideas. It works on the 8 an 10 inch drum triggers. The 12 inch drum trigger is made differently then the 8 & 10. If you go to http://www.DMdrummer.com under the DIY section, you will find a few users the converted a 12 inch drum trigger. I hope that helps. Sorry to hear about your issue. Where you having issues with the kick trigger before you did the mod? I ask because many users don’t mod there kick until they start having issues, thinking the mod will fix it. Then it turns out that the piezo was damaged before they even did the mod. After doing the mod, it was damaged further causing it not to work at all. The fact that you state after the mod the sensitive wasn’t very good (even with tweaking) suggests to me that there might have been an issue before the mod or damage was done to the piezo during your first mod attempt. There really isn’t much that can be wrong. Either the wires from the piezo are not wired to the jack correctly (or do not have good connection), or the piezo is damaged (either meaning a cracked piezo, which is typical of an un-modded kick trigger, or the wires broke off the piezo). A piezo element is a very inexpensive part (do a google search for peizo element). Double check to make sure you have the piezo wired correctly to the input jack. This is also assuming you did a good soldering job. It is at this point that users typically find a wire has broken loose most likely while putting the trigger back together. Let’s go from there and see what can be done. BTW, this might help as well. Go to the “Alesis DM10 Mesh head Pad Upgrade Video!” over at http://www.DMdrummer.com. Its a forum site that I set up just for Alesis edrum users. There are many people who have done this mod and may be able to help as well. hi i just purchased an 8inch realhead drum pad for the alesis dm8 to add to my dm6 kit. i plan to do this mod because i like the feel of the mesh head i already ordered my billy blast 3 ply 8 inch drum head $15.00usd. the only thing i need to know is what thickness is that funky foam board you are using i went to my local craft store and they had big sheets of this really thin stuff and smaller thicker sheets the thicker sheet is 15/64ths and the thinner is 5/64ths ? The key is to get the black foam just above the edge of the drum shell. So the answer is which ever sheet works the best to make this happen. I can tell you that not all realhead drum pads are 100% the same. Some users had to double or triple the funky foam (EVA foam) to achieve the correct hight of the sensor sandwich. If you go with the thinner one, you could always double it up if you just need a little more thickness. I hope that helps. I performed the upgrade on an Alesis RealHead Kick Pad, and now the kick drum’s sound is very low. Any thoughts on what might be wrong or how to fix the problem? Forgot to mention I have a DM6. I would have said to up your sensitivity on your DM10, but your not using a DM10. Anytime one changes the physical way the trigger is constructed, setting in the module will need to be adjusted. When it comes to the DM6, the only thing I can think of is upping the pad volume. You should be able to find that in the DM6 manual. The truth is the DM6 is not really a good candidate for using with DIY pad because of its limited trigger settings. Any DIY that one would do for the DM6 really needs to be designed with the DM6 limitations in mind. Like I stated earlier, you can try to up the pad volume. Outside of that their isn’t much that can be done. Unless there are resistors in the trigger itself. If that is the case, you may need to remove them in order for it to function properly with the DM6. However, I wouldn’t recommend this if your kit is still under warranty. I have converted my Alesis Dm10 Studio kit dual zone Mylar heads to Billy Blast mesh heads. (Actually, only did one so far to see how I liked it). I followed the video and re-arranged the foam sandwich as instructed…. cut out the foam so the trigger plate is floating freely and reassembled the pad…. I did leave the hole in the grey foam and did not fill it with excess white foam as one video poster suggested. I now have very little volume or sound on that pad. I have tried adjusting the individual volume and sensitivity for the pad (various combinations) but, nothing seems to help. I’m guessing by you comments that you never removed the resistors (or small circuit board) on the trigger input jack when you did the conversion. When you move the sensor deeper into the pad, less of the impact will be felt by the piezo sensor. That is why I suggest removing the resistors on the input jack. If you are not comfortable soldering and removing resistors, and you still want this conversion to work, you will need to adjust trigger settings. Make sure that the foam just under the mesh head is actually touching the mesh head. If it is not touching, a hit will not register very well. If you have already set your sensitivity high (and Threshold low) and you are still having issues, chances are you broke a wire or cracked your piezo sensor durning the conversion. Sometime taking the pad back apart and physically tapping the piezo sensor with your finger while the trigger is plugged into your DM10 would confirm this. When you tap right on top of the piezo, you should get a nice solid and loud sound. If not chances are a wire is broke. If that is the case it will need to be solder back together. Keep in mind the break in the wire could be anywhere, but I would check the connections on the piezo sensor itself and where the wires contact to the input jack. If you are still having issues, you might want to check out DMdrummer.com for other ideas. I hope that helps. I’m considering this mod for my DM10 kit, and thank you for the video. However, I do have a concern. It seems to me that this mod would increase crosstalk between drums. Moving the piezo plate beneath the thick black foam reduces the amount of energy that is transferred from the stick to the piezo. You mention that you removed the resistors to counteract this (as an alternative to increasing the sensitivity parameters, which would accomplish the same thing). My concern is that the energy transferred to the piezo from the stick hitting adjacent drums will not be appreciably attenuated by rearranging the foam, yet will be increased by the removal of the resistors (or an increase in the sensitivity parameters in the module). If you increase the sensitivity of the drum by removing the resistors (or adjusting parameters), you boost the adjacent drums interference. It seems to me that this would significantly reduce the ratio of the energy from the stick hitting the intended drum to the energy from the stick hitting adjacent drums, causing an increase in crosstalk. Have you performed a critical assessment of crosstalk both before and after the mod? Controlling crosstalk is already touchy with my kit. I’m actually considering using separate stands for each drum. Thanks again for the great information on your website. What do you consider “Critical Assessment”. If you are asking if I hooked up test equipment and ran some numbers comparing the two side by side, then the answer is no. If on the hand, you mean I made the modification based upon concrete understanding of the way electronic drums with reflection plates work, then yes. All kidding a side, the mod has been done by hundred (if not thousands) of users and I can tell you that increased cross talk is not an issue. I really don’t want to explain word for word why this mod actually fixes many issues with the DM10 kits as that would be a book in itself. With that stated, this mod does require the user to go back through all of his settings and readjust them. If you want to read about more people doing this mod (and some of them have made other small modifications to this particular mod) please check out http://www.dmdrummer.com/index.php?topic=131.0 over at DMdrummer.com. BTW, that site is a great resource for all things Alesis edrums. I hope that helps. Thanks for the reply. By ‘critical assessment’, I was simply curious if crosstalk was something that was noticeably compromised by the mod, or if people were giving it special attention both before and after the mod. I’ll give it a shot and see what happens, as I despise the factory heads. Thanks again for the info. I don’t want to make the mesh conversion, nor the inner foams re-arranging thing, just interested in making it dual zone, do I still need to remove the resistor from the connector circuit? well done video kudos! however i simply want to replace mylar with mesh, not solder or rewire or buy foam. all that is not a huge deal. i just don’t want to do it. so my takeaway is “no” you can’t basically replace studio dm10 heads with mesh heads. Hello, I had some questions about the 3m double-sided film tape you mention and use in the “Alesis DM10 Pad Upgrade Video!” video. There are so many different kinds that 3m makes. What model# of 3m film tape are you using? I want to make sure I get something as similar as possible. Also, instead of adding a rim piezo, I’m replacing the existing piezo for the head that is attached to metal/plastic disk inside the Alesis DM10 kick pad. Would I use the same exact double sided tape for that? Or would you recommend a different tape to attach the piezo in that case? Or some type of glue instead? Also I read somewhere that for a 27mm piezo to make the adhesive dot 22mm centered so edges can flex. But when I took the old one off it looks like Alesis made the adhesive 27mm in diameter, the same as the diameter of the piezo. Should I do the same or try to do 22mm for the kick pad? Should I put something like hot glue over the top of the new piezo? It looks like that is what was on top of the old factory one. Thanks for the reply Phil! Have you every used carpet double-sided tape instead? Would that hold the piezo as well as the tape you use? Is it ok to apply the tape on the entire area of the piezo bottom side or do I need to do only use about 22mm diameter of tape leaving about 5mm around the edge of the 27mm piezo free to flex? 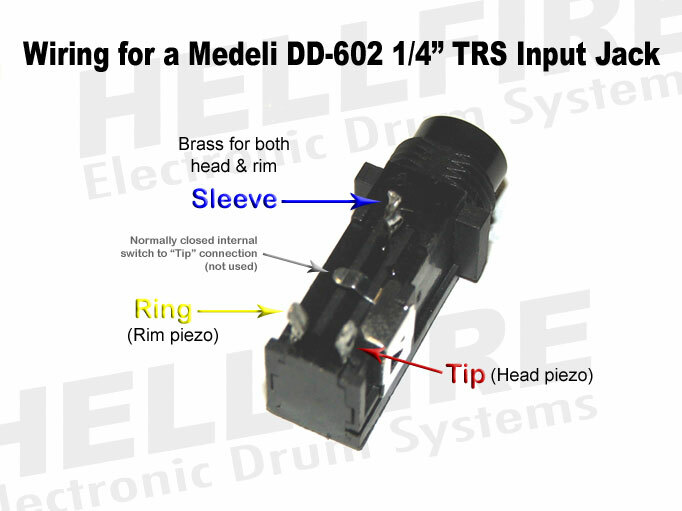 This is for the piezo attached to the metal/plastic disk in the Alelsis DM10 kick pad? MARK Drum & 2Box eDrum kits at US stores!